For women leaders, the typical perception is that they have reached the top alone. When the rumors began to circulate over Hillary Clinton’s vice presidential pick, Elizabeth Warren, the popular, progressive senator from Massachusetts, was labeled a highly unlikely choice. Even the possibility that they would meet to discuss the idea was dismissed, with some pundits sniffing that, well, two strong women simply could not work together. It’s hard to find examples of two high-level women collaborators, said Betsy Polk, a Chapel Hill, N.C., consultant on leadership. She co-wrote the 2014 book, Power Through Partnership; How Women Lead Better Together. ‘It’s more likely when you ask about partnerships, people will say Ben and Jerry,’ she said, of audiences who come to hear her and her collaborator Maggie Ellis Chotas talk about their book. Women collaborators are scarce enough that it was a challenge to find subjects for their book, said Polk and Chotas, who are long-standing business partners. The pair spent months trying to track down examples of women in those roles. They built up a list and interviewed 125 women who were part of business duos, mostly entrepreneurs and small business owners. As far as visible female duos are concerned, politics is similar to the executive suite. There are – and have been – women governors, such as Bev Perdue in North Carolina, Jan Brewer in Arizona, and currently Nikki Haley in South Carolina. They stand out as the sole, or nearly the sole, woman in every photo. Occasionally, women have run together in a pair to become governor and lieutenant governor. But each of the five duos who have tried it over the past two decades have failed to be elected, according to the Center for American Women and Politics at Rutgers University. The Washington Post reflects on women in politics in Washington DC. Does the bipartisan camaraderie on the softball field reveal anything distinctive about women in Congress? The answer is mixed. Let’s look at three things we can learn from the research about women in U.S. politics. Some early 20th century commentators mocked the idea of women entering politics by predicting that women would make public life so domestic and cozy that we’d see ‘the White House full of kittens!‘ Though post-suffrage politics has involved fewer felines than one might have hoped, there are areas in which research suggests women in politics may deviate from the male norms of behavior. Collegiality and friendship – or at least a display of it – appears to be one of these. Investment in bipartisan friendships appears to be common among women in politics. Jennifer Lawless and Sean Theriault’s research on cooperation in Congress finds women are indeed more likely than men to partake in three of the key bipartisan social events in congress –the Secret Santa gift exchange, Seersucker Thursday and the softball and baseball games. Of course, this may be because there are comparatively few women in national politics. In the U.S., women hold only 19.4 percent of all seats in the House and Senate, and globally only 22.7 percent of all legislators are women. So friendship and social networks may be an especially important source of political capital and support for women. Similarly Tiffany Barnes finds, as she describes in her new book on women in Argentinian politics, that women are more inclined to collaborate, in part to overcome the structural barriers that otherwise limit their influence. 2. But women don’t necessarily get involved in more bipartisan legislation. Does women’s added collegiality translate into bipartisan policymaking? Research offers mixed results. In general, scholars find that when it comes to legislation, women and men are much more alike than they are different. Both are influenced by partisan and constituent demands. But in some instances, friendships from events such as softball do appear to be important sources of bipartisan legislation. Interviews with congresswomen after last night’s game offered plenty of examples of bipartisan work among women after friendships were formed on the field. Democrat Cheri Bustos (Ill.), for example, said that she and Republican Kristi Noem (S.D.) led a bipartisan letter addressing ethanol regulation as a result of getting to know each other on the softball team. Republican Ileana Ros-Lehtinen (Fla.) claimed that the softball game ‘makes for camaraderie in a positive way and that always ends up in good legislation.’ She and Democrat Katherine Clark (Mass.) introduced the Pets and Women’s Safety (PAWS) Act after meeting during softball. She explained that the team provided a group of women to turn to when working on legislation, particularly on issues such as domestic violence and sexual assault. Beyond just those on the softball team, a 2015 Quorum study of the U.S. Congress’s 111th-114th sessions, which ran from 2009 to 2015, found women in the Senate were more likely to co-sponsor with another woman. Female senators co-sponsored an average of 6.3 bills with a fellow woman (including women across the aisle), compared to the 4.1 bills men sponsored with other men. It is important to emphasize, though, that general patterns of bipartisanship (or lack thereof) are not unique to women. After looking at various measurements of bipartisanship – including bipartisan CODEL participation, bill co-sponsorship, procedural votes, and amendments – Lawless and Theriault ultimately find no evidence that women’s legislative behavior is significantly different to men’s. So while there are specific instances where congresswomen work together across the aisle as a result of the softball game, women overall are not more likely than their male counterparts to engage in bipartisan legislative activities. 3. Women in Congress try to represent women’s distinct policy concerns. The Congressional Women’s Softball Game stands out from most congressional events in another way, beyond being bipartisan: It’s explicitly gendered, as very few congressional activities are. The players wore pink jerseys and raised money for young women with breast cancer, all while Beyoncé’s ‘Run the World (Girls)‘ was played again and again. In other words, this is emphatically an event by and for women. Do the women in Congress also work to represent women – and women’s interests – on the legislative floor? Again, the research is mixed. In his analysis of roll-call voting, Brian Frederick finds that Republican women in the House are now ‘ideologically indistinguishable’ from their Republican male counterparts. But partisan voting patterns are not the only way to measure activity in Congress. Michele Swers shows that women members in both theHouse and the Senate are more likely than their male counterparts to advocate for ‘women’s issues’ – issues related to social welfare, women’s health, child care, equal pay and the like. Indeed, a shared interest in ‘women’s issues’ sometimes brings women together across party lines. In 2009, Wasserman Schultz announced that she had breast cancer. Her diagnosis was part of the spur that brought women in Congress together for their very first Congressional Women’s Softball Game to benefit theYoung Survival Coalition. Wasserman Schultz then introduced the bipartisan Education and Awareness Requires Learning Young (EARLY) Act to increase knowledge of breast cancer among women, and though not enacted that session, many of her softball teammates cosponsored the bill. Susan J. Carroll finds women in Congress often feel a responsibility to act on behalf of women both within and outside of their geographic districts. Exactly how they define women’s interests, of course, varies from one to the next. Congresswomen often work to represent women at the intersection of their racial and gender identities, and do so from the points of view of their own parties and ideologies. Several studies also show that women members givemore floor speeches than their male counterparts, and are more likely to discuss women when they speak in Congress. Again, though, these gendered claims are filtered through partisan allegiances, with Republican women discussing how taxes and business issues affect women, and Democratic women advocating more often for social welfare policies. Wasserman Schultz might have been correct when she said in a 2010 floor speech that women in Congress ‘not only know how to have a good time, know how to play softball, but they know how to get along.’ But that desire to ‘get along’ doesn’t always result in more bipartisan policymaking, especially in this era of partisan polarization. So though women’s softball might not be indicative of a completely different way of doing politics, bipartisan friendships and an emphasis on women’s issues are important features of political life for some women working in a still male-dominated Congress. Recently, Hillary Clinton promised that, if elected, she will name women to half of her presidential cabinet posts. If that happens, Clinton would join a handful of other global leaders who have appointed equal numbers of men and women — including, most recently, Canada’s Prime Minister Justin Trudeau. Parliamentary systems seem to make it especially hard for female leaders. Research on advanced industrialized parliamentary democracies by O’Brien, Matthew Mendez, Jordan Carr Peterson and Jihyun Shin found that male-led, left-leaning governments actually appoint more women to cabinets than those with female prime ministers or female-led coalition parties. Why? O’Brien and her colleagues argue that unlike presidents, female prime ministers and party leaders always face the possibility that they could be removed from their post. Female leaders may feel especially susceptible to male challengers — and try to cultivate their loyalty by appointing these men to cabinets. These women also need to be conscious of how their actions will be portrayed in the media and perceived by voters. Appointing too many women in high-profile posts may be interpreted not as progressive but as driven by favoritism or sullied by identity politics. Of course, the parliamentary electoral system is also very effective in keeping women out of parliament in the first place. In the United States the suffrage movement has been commemorated in Washington DC by President Obama. On 12 April 2016 - Equal Pay Day - US president Barack Obama unveiled the newBelmont-Paul Women's Equality National Monument, the site of the National Woman's Party headquarters since 1929. 1. While the United States has been a leader on women’s rights historically, it lags in electing women to high political office. 2. Eighty-four of the 435 members of the U.S. House of Representatives are women. 3. With a share of 19.4%, the United States is in 95th place globally – down from 70th place in 2011. The share of women did increase, however. 4. The United States thus ranks behind countries such as Bangladesh (20%), even with Kenya or Greece (19.7%) and just ahead of Kyrgyzstan (19.2%) and Tajikistan (19%). 5. The United States oversaw the implementation of new constitutions for Iraq and Afghanistan that guaranteed more female representation. 6. The Iraqi parliament has a 26.5% share of female representation, ranking 56th in the world — and Afghanistan has a 27.7% share, placing 50th. Both rank ahead of the United States itself. 7. Both countries established a quota system reserving about one quarter of their legislatures’ seats for women – a share just above the world average of 22.7%. 8. Due to the quota system, Iraq is now above the Arab States average of 18.4%, according to the Inter-Parliamentary Union report. 9. There is a broad range within those countries. Kuwait, for example, has just one woman in parliament, while women make up a fifth of Saudi Arabia’s parliament. 10. The Saudi share of women in parliament is slightly greater than that of the U.S. House of Representatives. 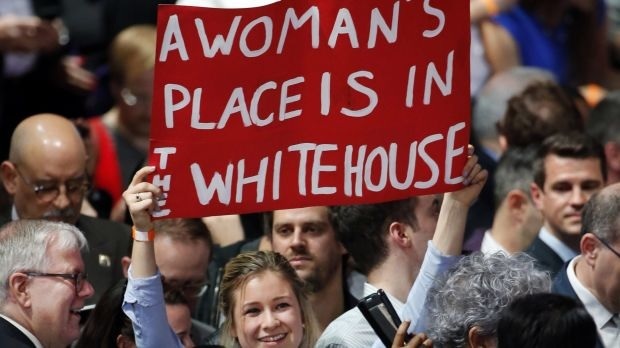 The Sydney Morning Herald article on the New York primary wins for Hilary Clinton and Donald Trump features a photo of a young woman holding a hand made poster saying 'A woman's place is in the Whitehouse'. This is the cover for our postcard campaign. Kindly used with permission from the Palczewski Suffrage Postcard Archive. Our postcard can be sent for free as an ecard from this site.